What to expect during the Dutch CBR Theory Test? Read more! What to expect during the CBR Theory Test? You have been studying for your CBR Theory Test? And you have planned a day and time slot to take the test? Of course you want to be as prepared as possible to pass this test, so that is why we’ll inform you about the topics and questions you can expect get during this Driving Theory Test. Not yet fully prepared? 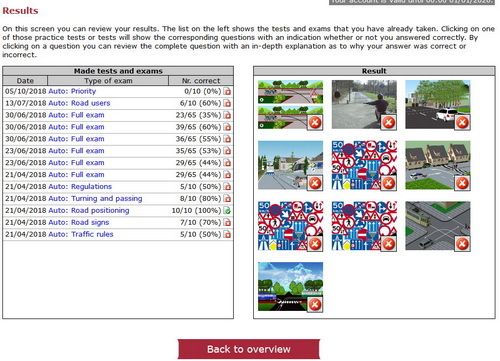 Then take a look at this excellent on-line e-learning training and testing tool TrafficTrainer. Here you’ll also be trained for the new ITEC Cubicle or Individual Driving Theory Test; this is the new norm: a completely individual theory test that will gradually replace the old class test. You’ll be taking this test in your own individual cubicle with a touch screen and will be able to answer questions within a limited amount of seconds (see below), whereby there is a maximum time limit of 30 minutes for the whole test. IMPORTANT TO KNOW: Cubicle Theory Tests in English are only available for the car driving licence. 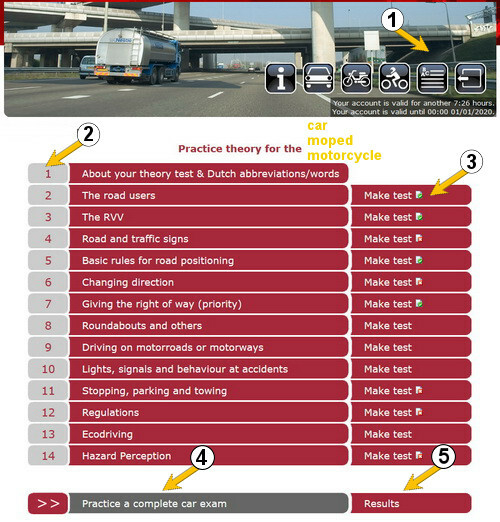 For the mobility car/moped/ motorcycle you either have to take this Cubicle Theory Test in Dutch or the Individual Theory test with an official TolkenNet translator who will translate the questions and possible answers from Dutch to the language of your choice! The CBR Driving Theory Test for the light moped, moped, spartamet, brommobiel and motorcycle licences consists of 50 questions about the traffic rules and regulations and the pass mark is 44 out of 50. The CBR Theory Test for the car licence is divided into two parts, which can be separated by a short break. To pass, you must have scored sufficiently for both parts, otherwise the complete test will have to be taken again. These topics are presented to you on your own personal touch screen, showing the relevant picture and the accompanying question, plus answer text blocks, in the language in which you requested. possible traffic behind you through the rear view mirror. Open Questions: here you’ll need to key-in a certain Number (without decimals), e.g. 50, 70 etc. Hotspot Questions: here you need to answer by touching a certain point in the picture on the screen, like a traffic sign, etc. You can answer these questions – a photo, a picture or a drawing – in your own time, but remember that all the questions must be answered within the total time limit for the test. You can also click on the next button to proceed to the following question sooner. Questions that you are not sure about and leave unanswered, or that you want to review later can be marked; marked questions can then – time permitting- as yet be answered or corrected. Note that unanswered questions that you don’t mark cannot be retrieved and will therefore always be wrong! Also remember that only the visible road users, traffic lights, traffic signs, road markings etc. are relevant to the questions and answers! This really is an excellent fully English e-learning and practice questions tool, offering you all the latest studying and testing materials with immediate email support when needed! They are the only company doing this! Available for the passenger car, motorcycle and moped driving theory tests it covers all the learning materials that you’ll need to know plus a very extensive 12.000+ practice questions data bank. Updated daily, if necessary, this is really the best way to learn; so sign up for a week, two weeks, a month or more of unlimited access (no time restrictions) …… and off you go. Now you’ll be even more than fully prepared to take this test! Step 4: Take Complete Tests: take as many tests as you can so as to get a very broad knowledge of the set-up of the actual CBR Theory Test. Remember there are in 12.000+ practice questions! Keep testing yourself this way until you actually pass at least three of these complete tests in a row …. only then are you well and truly ready to go! Now you’ll be even more than fully prepared to take this test. Step 5: Review all the test Results that you took to see where you might be weak! The 40 or 50 questions of the CBR Driving Theory Test are divided into 25 categories, which are marked by a letter from “A” through to “Z”. Below you will find a chart explaining to which category a specific letter belongs. After this test you will receive the test result sheet from the examiner. On this sheet you can find the respective categories in which you either: answered wrongly, answered too late or answered not at all. These are the categories which will require extra attention while preparing for your next test! Have you got a question about our International Driving School, about the driving lessons, theory test or anything else? Take a look at our Questions & Answers page.